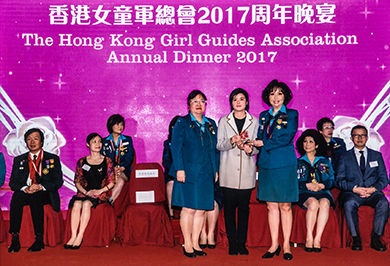 Chief Executive Officer of Por Yen Charitable Foundation, Dr. Lam Ho Yi attended the Hong Kong Girl Guides Annual Dinner 2017 on 25 November, 2017 held at the Kowloonbay International Trade and Exhibition Centre. Hong Kong Girl Guides Association has established in Hong Kong for over 100 years, its mission is to enable girls and young women to develop their fullest potential as responsible citizens of the world. Por yen Charitable Foundation sponsored the Annual Dinner to support the Hong Kong Girl Guides Association to their continued effort to training girls and young women in Hong Kong in their personal developments and leaderships.